Zach Browers was hurt during a mission overseas in 2007 where his spine was shattered by the wing of a plane. He suffers serious nerve damage over half his body, making it hard to walk, even in his own home. 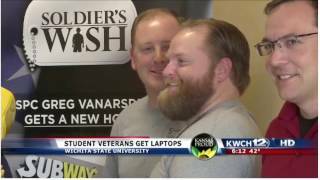 Concerned for his safety and mobility in their home bathroom that’s barely accessible, Brower’s wife Pam contacted Soldier’s Wish about Zach’s needs. 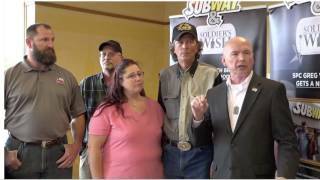 Soldier’s Wish surprised the retired Navy Chief during what he thought was going to be a quick lunch at Subway®. It was a Veterans Day surprise Browers never expected. We surprised Zach with a complete bathroom remodel that would make it both safe and accessible for this wounded Hero. Now, Browers, known for helping others more than himself, is nally getting some of the much-needed thanks in return.